I like coffee. I don't NEED coffee and I don't turn into a monster if I don't have coffee. But I do like it. And I know how good Italian coffee is supposed to be. But honestly (and I hope they don't kick me out of the country for saying this), I find it rather boring. There's very little flavor complexity to the coffee here. It's all just strong espresso. I like my coffee to taste like more than just coffee. I like to be able to detect chocolate or nuts or fruits the same way you're supposed to be able to detect more than just grape in your wine. So, of course, we had to check it out. It is a beautiful building both outside and inside (it was very bright out so my picture is not very good. Here's a much better one. The coffee wasn't as strong or as hot as I expected. But it was an interesting, new taste and I'll definitely take Gran here when she comes this summer. She'll love the interior and the fancy-ness of the place. Plus, she loves coffee :) You can check out their website here. Again, not the best picture but this was my caffé pedrocchi. Caffé pedrocchi. You can see a hint of the green mint foam (which is really more of a heavy cream than a foam). Thanks to Stephanie and Adam for the fun visit and the adventure in trying this new coffee (Steph's cup had mostly mint foam and very little coffee so she ended up eating hers with a spoon). 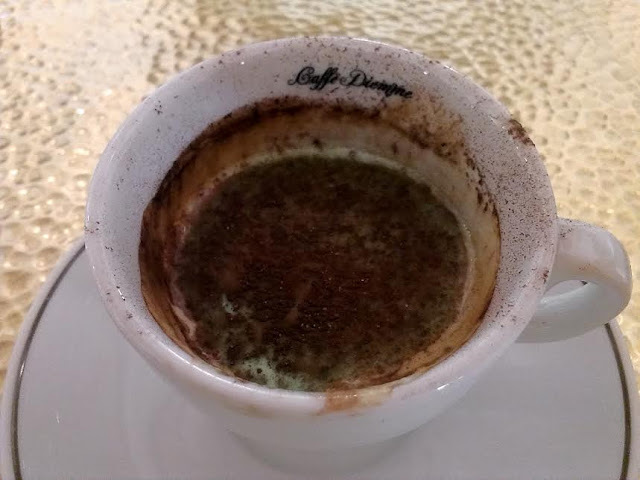 Labels: Caffé Pedrocchi, Coffee, Globe-hopping, I am not a blogger but I have a blog, Italy, Life Abroad, Padova, Sundays in My City, Where Am I Now? I LOVE coffee. I mean, really really LOVE coffee. I don't think I turn into a monster without it, but I can be pretty irritable if I don't get it. I used to think it was being deprived of the caffeine, but since I switched to Decaf a couple of years ago, I think it is just because I love the taste of coffee and all of the myriad of flavors that can be added to coffee. Having said all of that.... (and I hate to say this) but the caffe pedrocchi looks kind of nasty. I hope it tasted better than it looks, my friend!!! !